Lawrenceville, NJ – August 8, 2016 – Minding Our Business, Inc. (MOB), a nonprofit organization that has been recognized as one of the premier youth entrepreneurship programs in the nation, takes financial literacy to the next level, with the help of a $7,000 grant from State Farm. MOB began in 1997, as a community outreach program of Rider University’s College of Business Administration. Since its launch, MOB has coached and mentored more than 3,000 students on creating and running their own businesses. Many of the program alumni continue to run successful businesses developed during the program. The MOB Service-Learning Program operated from February 2 to May 6th of this year, at the Kilmer, Rivera and Dunn Middle Schools in Trenton and at the John Witherspoon School in Princeton. One hundred low-income middle-school students and thirty-six Rider University mentors participated in this year’s program. Rider University mentors guided thirteen groups of middle school students through the process of planning and running a small business. The MOB team businesses presented their business plans to a group of business judges in order to obtain loans for their businesses. Part of the loan money was funded by State Farm. The average loan granted per team was $175. Students and their mentors ran their businesses at Market Fair Day on April 8th in a festival-like atmosphere with food, music, and a teen talent show. More than five hundred Trentonians were in attendance. At the end of the day, nine of the thirteen team businesses were profitable and most teams were able to pay back their loans. The State Farm grant allowed MOB to infuse financial literacy into the curriculum of the Service-Learning Program. Students learned about making money, managing money, budgeting, and credit. “Financial illiteracy is especially prevalent among low-income groups including many African-Americans and Hispanics. MOB students and parents belong to these groups and are in greater need of financial education.” Stated Dr. Sigfredo Hernandez, MOB Co-Founder. The grant also allowed MOB to run financial literacy workshops for MOB parents and guardians including workshops on financial goal setting, budgeting, and credit management. “We are particularly grateful to Jennifer Young, Community Field Specialist, and Teanice Ernest, Trenton Agent, for the great support received from State Farm in the form of a State Farm Good Neighbor Citizenship Grant. This grant has allowed us to not only teach our students about business and financial literacy but their parents as well.” Stated Dr. Hernandez. MOB offers a Summer Program at Rider University for low-income Mercer County middle-school students. The program concluded on July 27th with the 2016 Business Plan Competition. State Farm was recognized at the event as the 2016 Prime Supporter of the MOB Service-Learning Program. 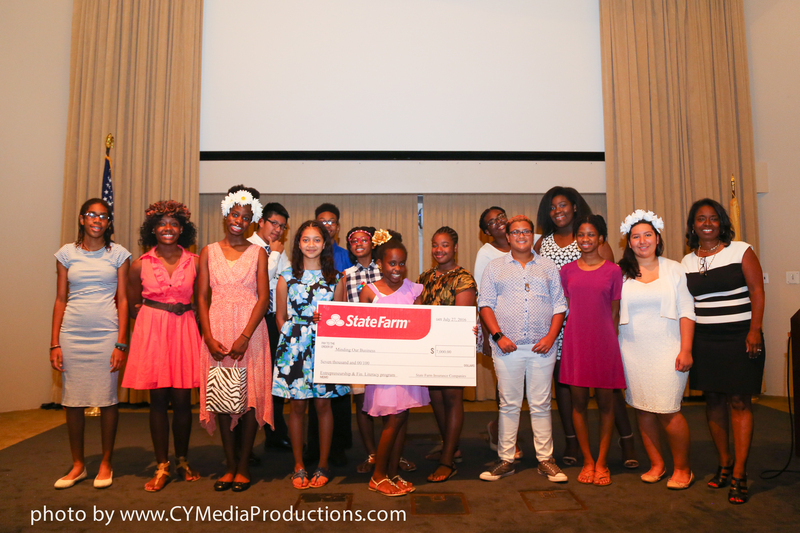 Teanice Ernest represented State Farm at the event where she presented the $7,000 ceremonial check.